HEVC, with better compression and faster/cheaper delivery over lower bit rates than H.264, clearly looms large over its predecessor. Apparently, HEVC is a better choice to send high-definition content over the congested network. However, even when Apple adds support for HEVC, and surely more devices are embracing the new format in the not-too-distant future, HEVC is not as popular as MP4 H.264. In many cases, you need to convert HEVC to MP4 for its wider acceptance. For example, YouTube highly recommends you to upload video in MP4 currently. 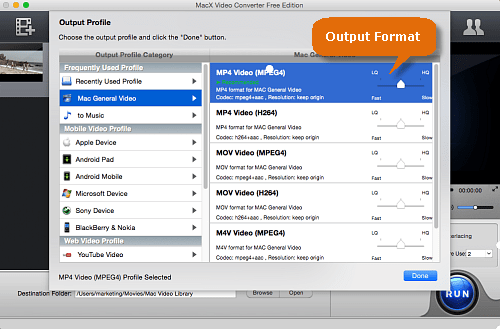 If you record any MKV video in HEVC codec, you will need to convert them into MP4 first. Of course, a free way is more preferred. Therefore, this post will introduce you the best H.265 HEVC to MP4 converter for free. - Free download and convert 4K HEVC x265 videos from 300+ sites to MP4. - Compress 4K H265 video at 10-90% compression ratio; edit, trim, merge, crop video. - Multiple CPU utility + Intel QSV tech to improve speed up to 5X faster! How to convert HEVC to MP4 (H264) free with the fastest speed. HEVC H.265 has compelling advantage over MP4 H.264 in the bitrate. But this smaller file size comes at a cost. When you play or decode HEVC 4K UHD/HD videos, it requires more CPU for processing. In other words, it will demand longer time for converting 4K HEVC to MP4 or other formats. That's why we recommend you MacX Video Converter Free (support multiple CPU cores usage up to 8) over other free HEVC to MP4 video converter choices, including Handbrake (check the detailed comparison below). Pros: Reliable and fast, 100% free & clean. 1. Freely convert HEVC (H265) video from MKV, AVCHD to MP4, H.264, MOV, AVI, FLV, WMV, 3GP and 370+ digital formats. 2. Convert 1-hour video 8K, 4K ultra HD, HD 1080P/720P HEVC into mp4 for mobiles, YouTube, online sites within 2 minutes. 3. Trim, edit, merge, crop, add watermarks & subtitles to hevc video files. 4. 100% free and safe, no potential virus, malware or spyware. Free and professional technical support offered! Step 1: Go to MacXDVD official download page to get this H265 to mp4 converter free download on computer and launch it. Click the import button with a "+" to add the HEVC h.265 video. You can freely add as many x265 videos as you want. Step 2: To free convert HEVC video to MP4, select the MP4 H.264 video from the popup window. In addition, there are other formats like mov, avi, flv, wmv, mkv, 3gp etc, popular devices and online site profiles built-in. Next, tap "Done" button. Step 3 (optional): Tap the scissor-shaped icon to edit your HEVC video if necessary, including freely set the video start/end time, remove unwanted video borders, merge video, etc. There are also options to further adjust video resolution, frame rate, bit rate, etc. Step 4: Click Browser and set an output folder. Then click "RUN" to start to free convert x265 HEVC to MP4 on macOS. Note: This free HEVC to MP4 video converter support mulitple-core conversion, which means that you can set the number of cores for the conversion. You can thus surf the internet while converting, or leave the free HEVC video converter to run at the fastest speed. 1. 5x faster speed when you convert HEVC to MP4 H.264- QSV hardware acceleration tech. 2. 10x faster speed when you convert HEVC to MP4 hevc- Auto Copy tech. 3. 300+ sites' HEVC videos free download to MP4, mov, avi, etc. for offline playback. 4. 370+ output formats (H265, H264, MP4, MKV, MOV) and 410+ latest devices (iPhone X/8/7/6s, Galaxy S8/Note 8, etc.). Convert videos among HEVC, H.265, MP4, MOV, H264, AVI, MKV, MP3, etc. A copy-and-paste conversion ensures untouched quality with auto copy. Freely download 4K hevc movies, hd, 3d or 360 from YTB, FB, Vimeo, 300+ sites. QSV has 5X faster than any others, and Auto Copy has 10x faster speed. Handbrake may be the first choices for many users when it comes to a H.265 HEVC to MP4 converter free download. Popular as it is, Handbrake HEVC conversion is not the best. In fact, it's the conversion performance that makes MacX a better choice than Handbrake. To better illustrate the differences, below is the speed comparison between the two free HEVC to MP4 video converters. A faster converter than Handbrake. Handbrake used to be my favorite video helper. It's powerful, easy to use, reliable, and has no malware and no nag-ware. However, recently I took a lot of 4K MKV (hevc) videos with my new 4K camrecorder and I had to edit and convert HEVC Mkv to MP4 for uploading to an amateur match. I noticed Handbrake to be slow to handle those 4K videos so I turned to other free HEVC to MP4 converters and found MacX. Eventually I bought its paid version. It's the fastest video converter that I have ever used. A good free Handbrake alternative. Handbrake is one of the tool I love to use before, but how come its installation now bundled with hijack apps, are completely disappointed me, even worst, it didn't ask if I allow to install. Then I found MacX Free Video Converter to be a good Handbrake alternative, except that it runs on Mac platform only. The best part I love is the output quality. I have no problem to play the converted mp4 videos on my Samsung phone. Does a better job for UHD videos. I have both free HEVC to mp4 converters installed on my computer. Usually I use Handbrake to handle all my conversion tasks as it's a habbit to turn to it at the first time. If I want to covnert videos into other formats, MacX converter works as fine. I have once tried the paid verion's QSV tech to convert the downloaded 4K MKV to h.264 and I was amazed at the speed. It was significantly faster! However, I often do the conversion overnight so I will just stay with the free edition.